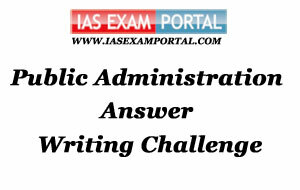 Weekly Mains Exam 2016 Answer Writing Challenge - Public Administration "MODULE- 54" | IAS EXAM PORTAL - India's Largest Community for UPSC Exam Aspirants. Weekly Mains Exam 2016 Answer Writing Challenge - Public Administration "MODULE- 54"
Public Administration- Paper I "Syllabus Topic – Accountability and control: Legislative, Executive and Judicial control over administration"
Q1. There should be minimum control to ensure the accountability. Comment. L D White has stated that Power in a democratic society requires control and higher degree of power needs equal amount of control, however, the control mechanisms designed must not cripple the authority. This requires necessary checks and balances between the different actors to ensure mutual accountability. In the case of Indian Public Administration, there must be accountability to the different actors and stakeholders- Parliament/Legislature, Judiciary, Executive , Customers and the Media. Each of these actors employs necessary statutory and regulatory tools to exercise control over the Administrative machinery and hold them accountable. 3) Judiciary: It exercises control over the administration by upholding the Rule of Law (A.V Dicey). Judicial Review and Judicial activism in the wake of the national emergency have been measures taken by the Judiciary to hold the administration accountable to the Rule of Law. The Constitution endows the Supreme Court under Artice 32 and High Court under Article 226 to issue writs of habeas corpus, mandamus, certiorari, quo warranto and prohibition. 4) Media : It has always played a critical role in mobilising public opinion and serves as a critical informer of the inadequacies of the administration. 5) Citizen : With the right to Information Act, the ordinary citizen is empowered to know the functioning of the administration and can hold it accountable through suitable grievance redressal mechanisms. Indian Administration- Paper II "Syllabus Topic – Financial Management: Role of finance ministry in monetary and fiscal area"
Q2. Highlight the change in Government of India Fiscal Policy post 1991 era.